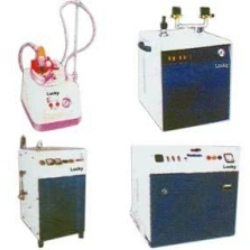 We offer Electric Steam Generator, Fully Automatic Steam Generator. Pressure vessel: boiler quality steel construction. S. S. Heavy duty electric heaters, imported water level regulator, electric solenoid steam release safety valve, water level gauge, safety release value. Water feed pump high pressure imported peripheral pump automatically injects water into the pressure vessel. Fully automatic pressure control, temperature control, water injection. Dry cutout device. Backed by rich industry experience, well developed infrastructure facilities as well as services of experienced industry professionals, we have successfully emerged as a leading name in the field of Washing Equipment, Drying Equipment and Dry Cleaning Equipment. The equipment finds application in areas like Garment Industry, Hospitals, Hotels and Dry cleaners. The complete product range in detail include Flat Work Ironer / Calender Machine, Industrial Dry Cleaning Machine, Industrial Drying Tumbler Front Loading, Open Pocket; Industrial Flat Bed Press; Industrial Hydro Extractor - Self Balancing With Auto D.C. Injection Brake and Industrial Washer Extractor, High Spin, Suspended, Computer Controlled With Auto Chemical Dispenser. Apart from this, we also offer customers Industrial Washing Machine Front Loading, Open Pocket With Or Without Low Spin Extract; Industrial Washing Machine Side Loading; Shirt Cuff & Collar Press; Steam Generator Diesel Fired, Fully Automatic; Steam Generator, Electric, Fully Automatic and Vacuum Finishing Tables. With more than 27 years of experience backing our operations, it is a matter of pride & delight for us to maintain our strong hold in this arena. This has also been made possible by services of experienced professionals, who have with them in-depth process knowledge & awareness regarding upcoming changes in technology and market changes. This allows us to introduce vital enhancements in our product range, thus ensuring our machines maintain competitive edge in global markets. Other than this, we can also customize the offered range of products as per specifications detailed by our clients.